We want your custom ring to fit just as much as you do. Here at Krikawa, we go a little over the top to get the very best size possible. Because your ring will fit differently at various times of the day, the month and the year, we are happy to offer a complimentary and frankly unprecedented finger sizing method that is more accurate than going to a jewelry store and trying on rings. We have determined that clients sized in this way rarely need their rings re-sized, as opposed to clients who have selected their size in a single sitting. Once you place your order, we will ship our calibrated silver bands that have the same width, thickness, size, and comfort fitting of your final ring. This service is complimentary if you have a deposit on file and you live in the US (see international, below). We even include return packaging. All you have to do is drop it in a mailbox when you are done! Please inquire about international charges. Because hands tend to swell and shrink, wear these through a day or a couple of days to get the best estimate of your ring size, and to ensure that the width feels comfortable. If your final ring is delivered in a size other than what you ordered, we will resize the band at no additional charge. If you decline our free sizing kit, and then need your ring resized, charges will apply. Consider investing in our 5 Year Extended Service Plan that comes with a free resizing and covers much much more! INTERNATIONAL: The round trip shipping of sizers to Canada via FedEx International Priority is $100. We will prepare all of the customs documentation and return package preparation, so it will be smooth and simple for you to return the package. Please inquire for shipping costs to other countries. What If You Have NO Idea What Size You Are To Start With? Request our plastic multi-sizer! Simply fill out this form with your mailing address and we'll ship you a multi-sizer. That way, when you place your order, we'll have a starting point for your sizing rings. Alternatively, you could print out this ring sizer chart for an estimate. If you use this form, make sure you print it without scaling, cut out the strip exactly, and pull it tight around the finger. There is a much greater margin for error on this method than the multi-sizer above! When you place your order, we can start by sending you a plastic multi-sizer. Once you've got an idea of your ring size with this plasic ring, then we'll send our calibrated sizing ring kit. 7 Ideas To Try If You Don't Know The Ring Size! Take a ring that your partner wears on the LEFT HAND ring finger to a jeweler to find out what size it is. Report to us the size and the width of that ring. Keep in mind that top heavy rings will want to be a little tight, not floppy. Take a ring that she/he wears on the RIGHT HAND ring finger to a jewelers to find out what size it is. Report to us the size, width, and whether this person is left or right handed. Take her/his ring finger ring and put it on one of your fingers, if you can't steal it for a day. Mark where it goes up to with a pen, then order a plastic multi-sizer from us and find the ring size that goes up to the same spot. 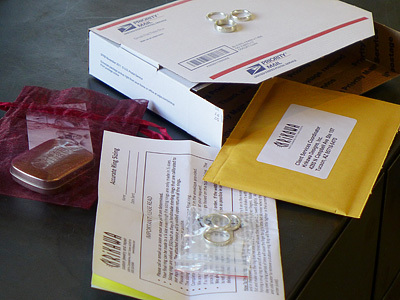 Take her/his ring finger ring and press it into clay/wax/sculpey/art tack and send it to us. Let us know her/his weight, height and body type and we will guess. Future sizing most likely necessary, so consider investing in our 5 Year Extended Service Plan that includes a free resizing! Disclaimer: We defer to your final answer for the ring size. Ring resizing is subject to additional charge, price dependent upon a few factors (metal type, up or down, etc).